Recently when I was embedding a Facebook video on this site I found out that I can't see the video. After refreshing few times still didn't see anything. Then I thought what's wrong with it? How about people? I'm sure many people around the world probably having the same problem. So after solving the problem I thought why not share this with other people. 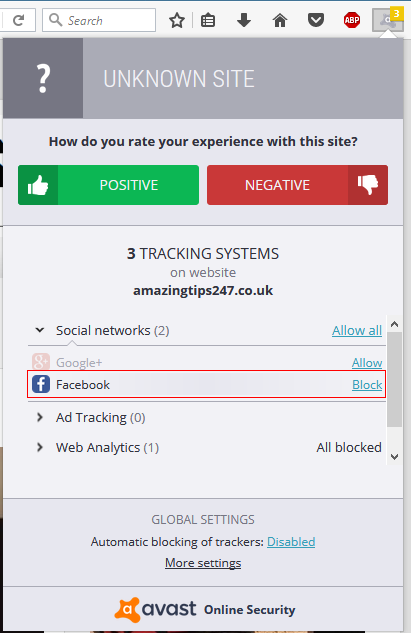 The solution is that if you are using an Avast online security add-on then make sure you allow the the Facebook by clicking on the Avast icon at the top then clicking on allow link next Facebook, as you can see in the picture above. This is one of the side effect of not liking to be tracked. You block them and you miss lot of their contents. 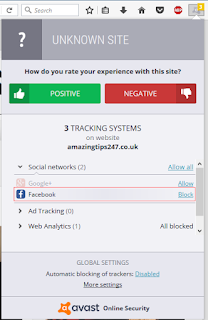 I make a lot of sense, because many people out there are too sensitive and don't like to be tracked or don't want to see ads so they use ad-blocker and stuff yet they like to enjoy the contents. :( Mate, to get something you have to sacrifice something.